Well before Wisconsin Gov. Scott Walker began his unholy crusade, the Right was heavily promoting its claim that public employee unions are a threat to the public. The title of a 2009 book by conservative ideologue Steven Greenhut said it all: Plunder! How Public Employee Unions are Raiding Treasuries, Controlling Our Lives and Bankrupting the Nation. What the union bashers are trying to obscure is that public employees have a long history of supporting policies that promote the broad public interest. This goes back to the very roots of the public employee union movement. In the 1890s teachers in Chicago created a federation that became the first real teachers union and one of the pioneers of public employee unionism in general. 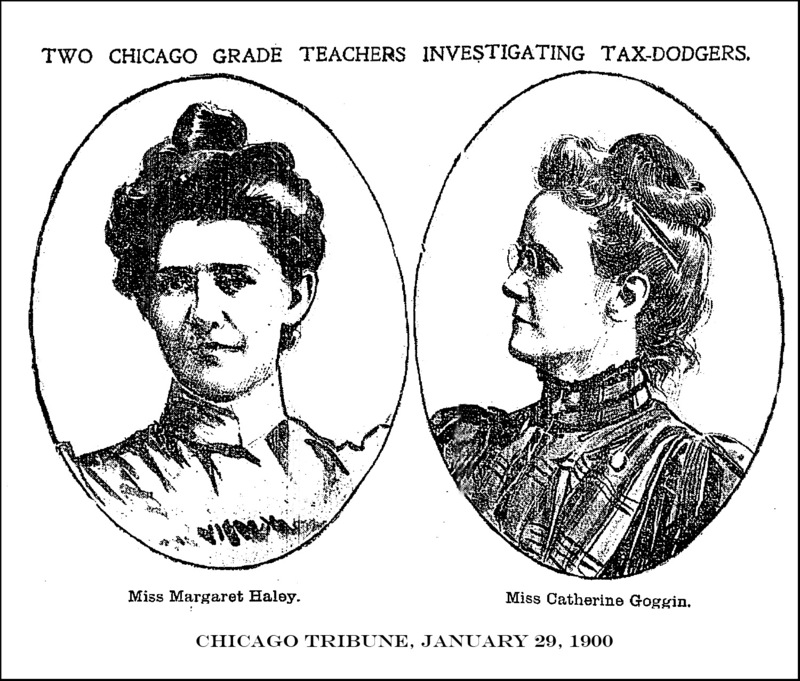 When the federation, led by Margaret Haley and Catherine Goggin (illustration), was confronted with a move by the board of education to cut teacher salaries because of a purported fiscal crisis, the teachers responded to the claim of a revenue shortfall in a creative way. They launched an intensive investigation of tax dodging by some of the largest corporations in the city, finding that property tax underpayments amounted to some $4 million a year (serious money back then). Tax officials were reluctant to crack down on powerful business interests, so the teachers sued, eventually winning a favorable ruling in the Illinois Supreme Court (though the U.S. Supreme Court later went the other way). The teachers of Chicago daily faced the horrors of overcrowded, unsanitary buildings stuffed with too many children and controlled by an impersonal bureaucratic structure. This they did with poor pay, no job security, and no pension system. The efforts of teacher organizations to address these problems, through collective bargaining as well as tax justice campaigns, also redounded to the benefit of the students and their families. The Chicago teachers were also an important force in the passage of the Illinois Child Labor Law of 1903. That cynic might say this was aimed at boosting school enrollment and increasing the demand for teachers. Maybe so, but can anyone deny that banning child labor was also a boon for society as a whole, aside from sweatshop proprietors? In the decades that followed, unions of teachers and other government employees have been among the strongest advocates of a vibrant public sector. They have continued to be leading critics of corporate tax dodging and opponents of efforts to gut public services. Unions such as AFSCME have been at the forefront of campaigns to stop the contracting out of government functions and the privatization of public assets such as highways—practices that usually work to the detriment of taxpayers as well as public employees. The state and local public employee unions accomplished this against all odds. Denied the protection of the National Labor Relations Act, they had to get states one-by-one to recognize their right to organize—the right that is at risk in Wisconsin and elsewhere. It took a period of remarkable militancy in the 1960s and 1970s—including defiance of laws banning strikes by public employees—before they made significant progress. Among those strikes was the 1968 walkout by sanitation workers in Memphis, where Martin Luther King Jr. was visiting to show his support when he was assassinated. And even then there were often severe fiscal limits on the ability of public employees to bargain for substantial wage gains. To compensate, many public unions put more emphasis on securing better retirement benefits for their members. These pension rights—in effect, deferred wages—are now under attack as if they were some giant giveaway. The real giveaways are the lavish business tax cuts and corporate subsidies that the likes of Gov. Walker promote at the same time that they are demanding severe concessions from government workers. The great confrontation of 2011 comes down a question of whose interests are more closely aligned with those of the public at large: those who teach our children, drive our buses and put out fires in our homes—or superwealthy individuals and large corporations that are reluctant to create new jobs. With each passing day, the momentum is moving in favor of the descendants of the 1890s Chicago teachers who are fighting for their rights and for the public interest in Madison, Columbus and other capitals across the nation. Note: A new movement called US Uncut is organizing actions around the country calling for a crackdown on corporate tax dodging as an alternative to harmful cuts in government programs such as education.